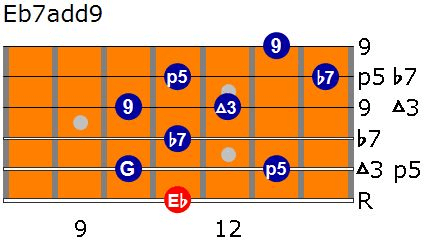 In this lesson, we will learn how to improvise with the half dim arpeggio over the dominant chord to get the 7add9 sound. I will demonstrate it over a blues form in two difficulty levels. The easy level uses the arpeggio itself and the advanced level adds an ornament. Arpeggios are broken chords, where the chord notes are played as single notes. Know the arpeggios of every chord you are improvising over. 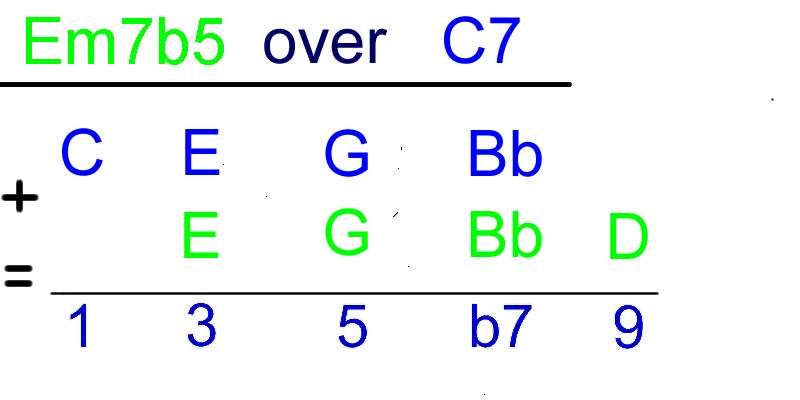 at least 5 positions for each chord. Know how to decorate the arpeggios with trills, ornaments and rhythm variations. 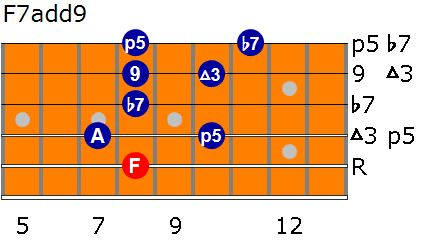 Know how to move from one arpeggio to another through the closest note, everywhere on your fingerboard, to be able to create long sentences. 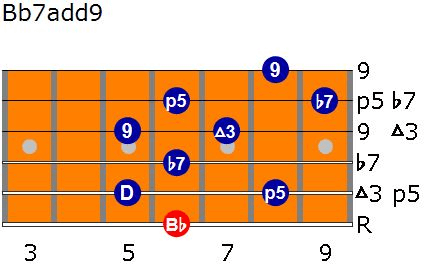 The best way to get the 7/9 sound is by playing a half dim arpeggio starting from the 3rd degree of the dom7 chord. 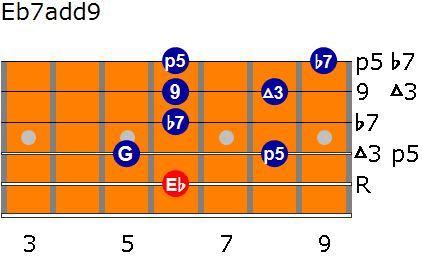 In the following example, we want to get the C7/9 sound by playing a half dim arpeggio from the 3rd degree of the chord C (=the note E). 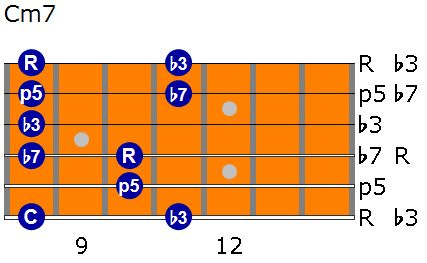 Let’s do the same over the chords of blues in Bb. For Bb7 we’ll play a Dm7b5 arpeggio. We’ll also use a Cm7 arpeggio for the Cm7 chord. In the following shapes, you’ll have the root of the Dom7 marked in red and the m7b5 arpeggio starting on its 3rd degree marked in blue. 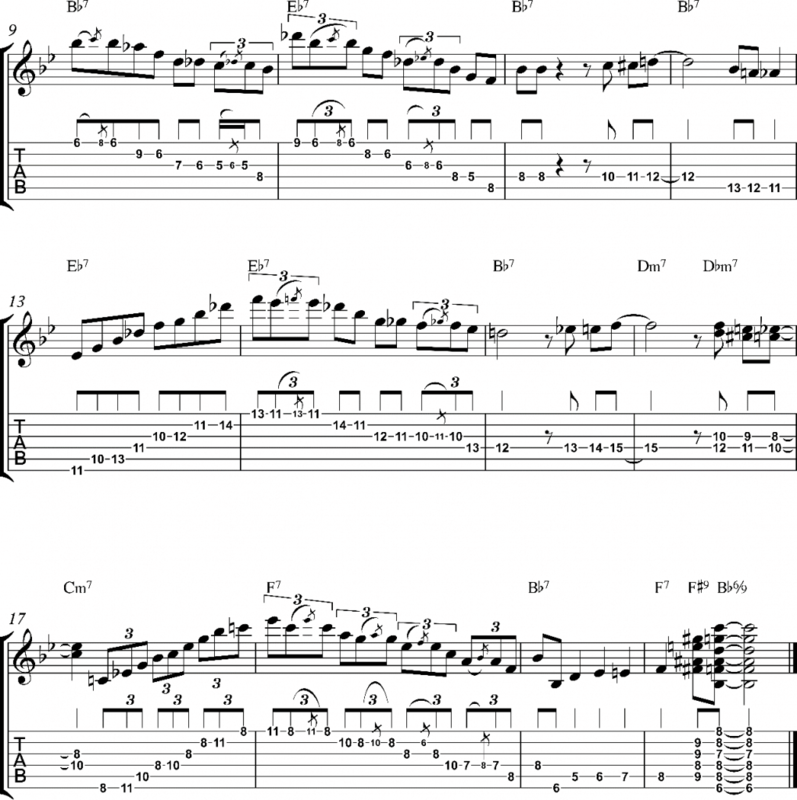 Here are four licks based on these arpeggios. You can play each lick in a simple way or you can add the ornament to make the phrase more interesting and stylistic.I have used the same ornament in all the phrases. The ornament adds one hammer-on with a note above the arpeggio note. 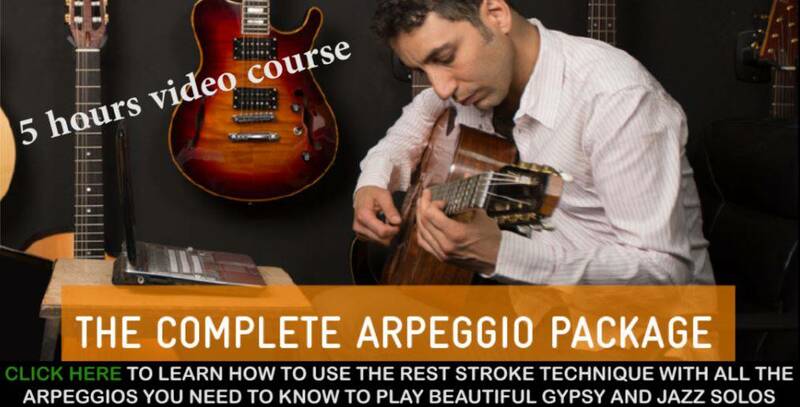 Click here to learn how to master all the arpeggios you need to know to play beautiful Gypsy and Jazz solos and master the rest stroke technique. Thanks Trent! I am happy to hear that! Thanks sir..to send me this arppegio..i am a big fan of urs..can u plz send me the c major triad staff note…in my mail…have a nice day sir..
Good lesson which I’m currently spending time absorbing. I understand the close relationship between Dom7 and Half Dim but can the Half Dim also be played over other arpeggios too? To my ears it sounds like it would work over a straight Maj chord? The Half dim7 does not fit the Maj7 chord, because it has the b7th degree of the root chord. give you the 9th sound, you have to play a m7 chord and not a m7b5 chord. Belated many thanks for your reply Sir! Thank Joe! I will. Cheers!